The process of relocating BluJay’s U.S. Headquarters culminated on Friday, January 12, 2018, with a ribbon-cutting ceremony at the new Holland, Michigan office space located in the Holland Technical Center. A proud day as we finally get to celebrate the smooth transition of 250 staff members into the premier high-tech engineering campus. 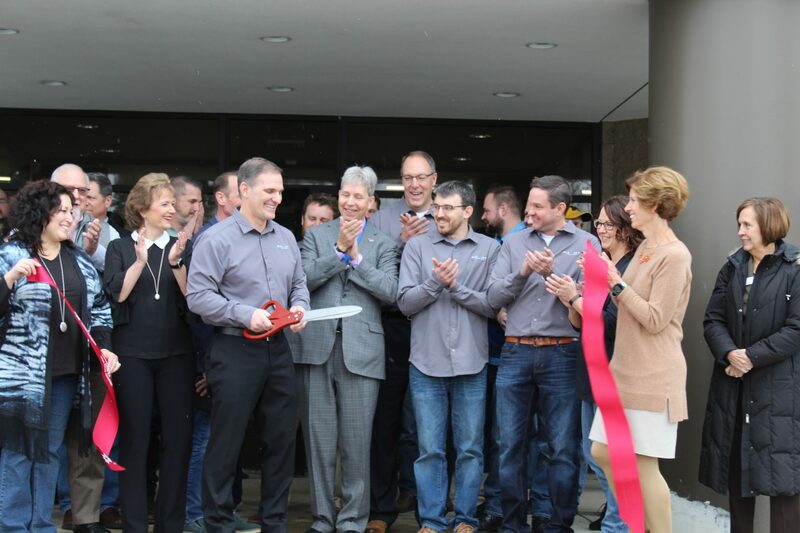 BluJay’s Doug Braun, CEO, and Tim Hinson, COO, were joined by Nancy De Boer, Mayor of the City of Holland, and the Michigan West Coast Chamberk as they spoke to the audience of staff, family, and friends that gathered for the official grand opening. The 77,600 square feet of tier-one office space is almost double the size of the previous building located a mile-and-a-half away in South Holland. Holland Technical Center was an appealing choice because of its unique on-site amenities and features, including an in-house café, health club, and ample parking. Currently BluJay has 14 offices in 12 countries around the globe. The new U.S. headquarters is the largest office in North America, with room to grow into an additional 30,000 square feet supporting future expansions and workforce growth of up to 400 employees. Notably, the biggest success of the move was being able to transfer all operations without any business disruption or delay in service, and continuing to manage $17 billion worth of freight moving through our system. With the help of JLL Commercial Real Estate, BluJay completed several changes before the transition. The revised floorplan combines teams and resources to accommodate a more collaborative work environment that fosters better work flow and creation. We look forward to continued growth and making a positive impact on the community around us, both locally and globally.